Below are my magic show packages for birthday parties and other children's events with a small audience. These prices apply for most parts of New Haven, Hartford, and Middlesex County. Contact me today for quotes for children or family shows for larger audiences such as festivals, school shows, and Blue and Gold Banquets, or for events outside of New Haven, Hartford, and Middlesex County. For more information about library magic shows, click here. My standard magic shows are silly, zany, and best enjoyed by children ages 4-9. If you're planning a party for older kids (ages 8 and up), check out my TOP SECRET Magic Learning Workshop, as a fun alternative to a traditional magic show! Prices are subject to change without notice. Additional fees may apply due to distant travel, holiday bookings, and other special requests. 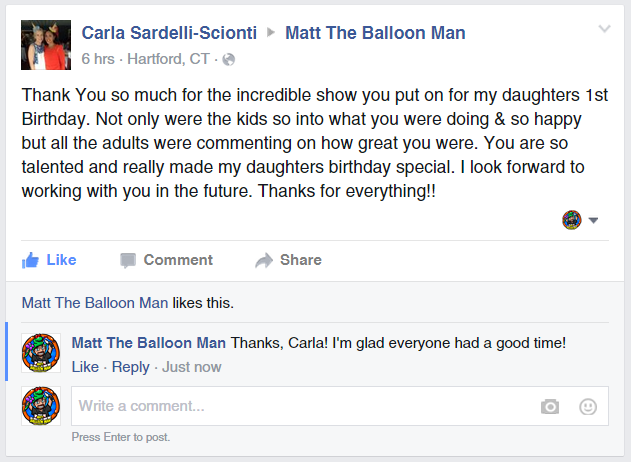 Please contact Matt The Balloon Man with the details of your party for an exact quote.